As if religion weren’t confusing enough, here comes a bunny symbolizing the holiest of Christian holidays. Not a rabbit, mind you, but a cuddly bunny. And apparently a bunny that lays eggs, which is weird for a mammal. We could understand an Easter lamb. Even a possum, with its famed wait-I’m-not-really-dead trick, would have a better claim on the story of the resurrection. Rabbits don’t believe in contraception, which may be the one legitimate connection they have to the church. When asked by an inquisitive youngster why there’s a bunny on Easter, parents have a better answer for why a fat man with magic reindeer flies around the world on Christmas, violating the civil laws of countless municipalities by breaking and entering. For those adults stuttering over a reply, here’s the abridged origin of the Easter bunny, guaranteed to hold the interest of no child let alone a kid amped up on jelly beans and chocolate. 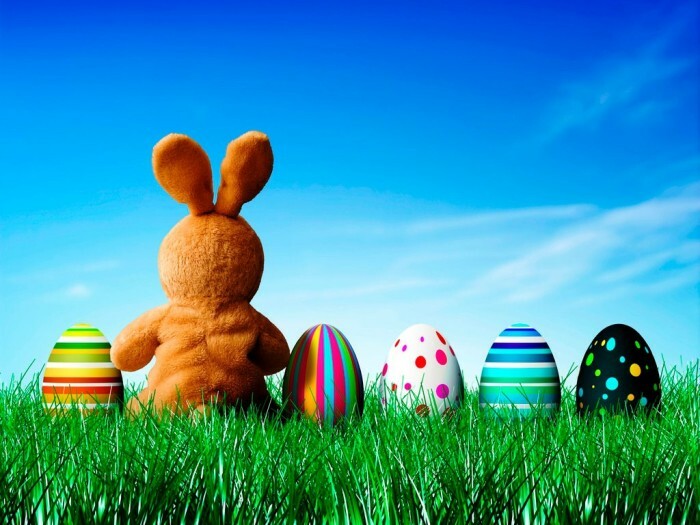 The Easter bunny first hopped into the holiday back in the 16th century, when German folk legends told of a springtime rabbit delivering eggs to well-behaved children. In 1680, a writer named Georg Franck von Franckenau, whose name is kind of fun to say, was the first to formally publish the legend in a story about a rabbit who lays eggs and hides them in a garden. The tale made its way stateside when Germans emigrated to Pennsylvania Dutch country in the 1700s. Eggs have symbolized birth and the renewal of life throughout antiquity, but the rabbit in German folklore was borrowed from ancient pagan myths surrounding springtime. On the vernal equinox, feasts were held in honor of the spring goddess known to Saxons as Eostre (known to others as Ostre or Eastre). Her symbol was the rabbit or hare, which embodied the spirit of rebirth and procreation. Rabbits, of course, are famously fertile and breed like…well, like rabbits. A female hare (a close cousin of the rabbit) is so prolific she can give birth to one brood of bunnies while pregnant with the next. Apparently these critters don’t believe in contraception, which may be the one legitimate connection they have to the church. It seems ironic that Christianity adopted symbolism and the word “Easter” from paganism, which is historically disparaged by organized religions. But absorbing the images and practices of polytheistic peasant religions helped make the church more familiar and approachable to potential converts. In keeping, the bunnies, chocolate eggs, and candy-filled baskets help ease a child’s introduction to religion. Though difficult to explain, for a time they even spare parents the more delicate task of describing the New Testament’s story of the death and rebirth of Jesus. Easter symbolism may be one part pagan, one part Christian, and one part Cadbury, but we’ll take the chocolate bunny. Dark chocolate, if you please. Dip it in peanut butter and bite its head off. Happy Easter.